Reimbursement penalties as part of the Affordable Care Act are driving hospitals and health systems to develop programs to prevent readmissions. But, how much are these healthcare facilities really saving? 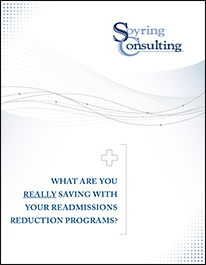 Download today to learn the specific programs that produce the greatest benefit in readmission reduction at the lowest cost! Soyring’s experience has aided our clients in managing their strategic and financial decision-making processes efficiently and effectively. Our team works alongside your hospital’s leadership and administration to develop and implement financial plans that connect your hospital’s mission to measurable financial goals and distinguish which objectives are financially sustainable given the hospital’s financial capabilities. Using a combination of our extensive experience, benchmarks from comparable hospitals, and best practices, we create action plans that will enable your organization to realize financial opportunities by increasing patient access to services, maximizing utilization of current resources, and exploring the addition of new services.